The saying “When you stop learning, you stop growing” is true for the instructor as much as the student. While the type of learning is different for both, it has the same purpose and ability to open the eyes of the willing participant. An emerging pedagogical mode of transformative learning experience growing in popularity is now impacting how a teacher instructs and how a student learns. This technology enabled environment allows an instructor to provide synchronous instruction to students in multiple locations through what is known as an immersive cloud learning (ICL) platform. ICL hangs its hat on the newer technologies that enable video conferencing and telepresence. A View From The Edge recently sat down with Joshua Gaul, Director of Educational and Emerging Technologies with the Division of Information Technology Services at SUNY Empire State College to talk about an on-going initiative at the college. Joshua recently delivered his message at NJEdgeCon2018, NJEdge’s annual conference held in January 2018. The key to success with the destination classroom is through its design where every student has a front row seat. ICL was envisioned back in 2013 to solve a problem on how to utilize the college’s most talented faculty by connecting them to college learning centers across the state. In 2014, SUNY Empire State College had a destination site in Manhattan and Staten Island, and in 2016, Rochester had a location. ICL has continued to grow and transform from there, with the next site being developed for SUNY Empire State campus in Buffalo, NY. This concept and design has grown in popularity and student appeal within the college because of how it allows students to take a high level course from a highly sought after professor in varying disparate locations, gaining instruction in programs they wouldn’t normally see offered. ICL is scalable in that it also provides the ability to collaborate with students from across the table, the state, or the world. Moreover, ICL lends itself well to hybrid course design thus bringing new potential to combining asynchronous and synchronous course components in one instructional design. “We get the best instructors we can to use the courses they design in this new modality. ICL course delivery is easy to market, excites students when they see it, and is deliberately different from any type of instruction they’ve ever taken before,” Gaul said. The learning environment is different from the traditional setting. 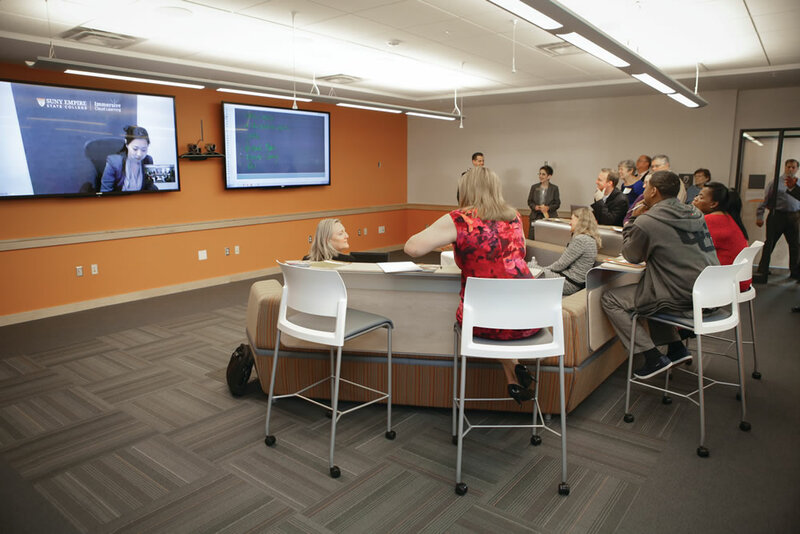 The source room where the professor instructs features two large screens and a fast- switching Polycom Producer camera in the middle that allows for motion and voice detection. This technology lets the professor teach their innovative presentation on one screen, while seeing all of his or her students at the different destinations on the other screen. For instance when applied to an institution in New Jersey, if the instructor from Newark is teaching to Trenton, New Brunswick, Hoboken, and Monmouth, they would see all four of those student groups. All of these rooms are designed to feel and look the same way. The instructor feels like he or she is in one giant classroom, while at the destination points, the students have couch seating and tiered seating placed behind it. Students see two 90-inch screens in the room. On one side, they see the instructor or the instructor’s presentation, and on the other side, the students see all of the other destination rooms filled with their fellow classmates. In between the screen resides a Polycom Director setup which hosts a dual camera implementation. One camera always maintains a wide shot of the room. The other camera is voice activated and has facial recognition. So, if a student starts to speak in a destination room, the camera finds the student who’s speaking, and if it finds a face, the camera will zoom in on that person. This configuration allows everyone to see which student is speaking. If the student isn’t speaking directly to the camera, the camera won’t pick up a face and won’t start randomly zooming in on all the students speaking. This type of class also includes technology that prevents audio issues or muffled noises from the different rooms. Each room is designed for ADA compliances and uses microphones with audio fences enabling audio to track the speaking throughout the room. This design helps students who may have audio issues or use hearing aids to still listen and follow the instructor. The rooms are also designed to fit wheelchairs and the student would be captured by the camera’s range. Courses using ICL are fostering a synergistic learning environment for students, creating countless educational possibilities. Students can use their own devices through Mersive Solstice, which is a wireless sharing system. This level of functionality allows students to share their content through the screen so that the instructors and other students can see it, making it easier for students to work together and collaborate on ideas. “At one of our quarterly Digital days, we had a faculty member from Manhattan share in his presentation about teaching with ICL, and he said, ‘One of the biggest things to realize about ICL is that you can’t just walk in and do it. This is one of the first times in a long time where I looked at my class and said I have to prepare for this. I have to really, really work hard and find innovative ways to get my students engaged in a way that I’ve never done before.’ This level of engagement is impacting education,” Gaul said. Instructors are working hard to find new ways to adjust teaching activities and in-class discussions, so they involve as many students as possible. They are taking a class they normally taught in a who may never set foot on campus, but could get a taste via innovative technology and virtual learning environments. Creating educational opportunities with endless possibilities and maintaining a focus on each individual experience is what the ICL platform does for students – it’s quickly transforming higher education and changing how teachers instruct and how students learn. Sharing insight into the progress and promise of ICL in higher education nationally is just one way in which NJEdge provides persistent value to its members. Interested in learning more about how your institution can implement and benefit from ICL and emerging telepresence instructional design? View NJEdge’s EdgeMedia offerings to learn more.